Dan is a 38-year-old man who presents to his physician with a six-month history of pain to the lateral aspect (outer side) of his dominant elbow. His problem started gradually after beginning a new exercise program at the gym. His symptoms have become worse, to the point that he has great difficulty lifting a dumbbell or at times even using a salt shaker. He has had to give up his exercise program as this has not improved his symptoms. On examination there are no visible changes to his elbow. He has tenderness over the right lateral epicondyle (tennis elbow). Any stress applied on the radial wrist extensors exacerbates his symptoms. Dan could potentially benefit from seeing a physiotherapist for mobilization of the joint, an orthopedic surgeon to assess if surgery is necessary and his local pharmacist for pain control medications. A bracing specialist may also be able to help with joint stabilization which may help him in his daily activities. Lastly, seeing a nutritionist may help him choose foods that help reduce inflammation caused by arthritis. Surgical and Other Treatment Options for Tennis ElbowDr. Bert Perey, MD, FRCPC, Orthopedic Surgeon, discusses tennis elbow symptoms and treatment including surgical options. An orthopedic surgeon is a surgeon who has taken additional training in the diagnosis and treatment of bone and skeleton-related problems, treating conditions such as tennis elbow. Bracing and orthotics are specialties within the medical field involved with the design, manufacture and application of orthoses and braces, which can help mange such conditions as tennis elbow. 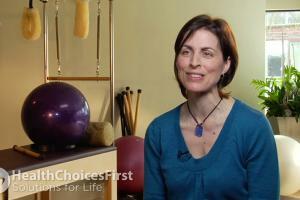 A Pilates instructor can educate clients on working with injuries such as tennis elbow, and arthritis. Pilates can help increase your flexibility and maintain optimal health. A personal trainer has achieved a level of certification and qualification in order to help people exercise safely with injuries such as tennis elbow. A physiotherapist is a health care provider who uses non-invasive techniques to prevent and treat injury or dysfunction, such as tennis elbow. Conversation based on: Symptoms of Tennis Elbow " Dan a 38-year-old man with six-months of pain to the lateral aspect (outer side) of his dominant elbow "
Once Dan has completed his rehab with a physiotherapist, he could benefit from working with a kinesiologist on making sure he adapts his exercise program appropriately given his injury. If he is new to the gym, an injury can be very demotivating and it would be a shame if Dan stopped working out. There are many ways a kinesiologist can help him understand how to safely exercise once he has clearance from a physiotherapist. Reply to: Symptoms of Tennis Elbow " Dan a 38-year-old man with six-months of pain to the lateral aspect (outer side) of his dominant elbow "
Forgot to mention , that this has been going on for over a year now ! I'd be curious to know if the entire arm were examined or just the elbow. I have tennis elbow that is actually caused by water retention due to shoulder tendinitis. Is the problem caused by tennis elbow gripping, or lifting, or both? Tennis elbow, also known in medical terms as lateral epicondylitis, is a painful condition to the lateral aspect of the elbow. How would you use foam rolling to help with elbow pain ? Would you be rolling the forearm ? Essentially what happens is the injured party finds an area that is sensitive and holds a ball or hard object ( to level of tolerance) over it by moving the affected area in a controlled manner. Always followed by icing down. Tennis elbow is caused by a tear in the muscle that inserts into the lateral epicondyle. It is the wrist extensors that attach into this bone, and patients can get a tear with a very trivial injury, or with a very heavy impact. Most of the time it’s not caused by any major trauma, patients just notice pain in the elbow, and it can be after lifting a box of groceries. Is this similar to foam rolling ? Good points Ram. Friction is a great tool to relieve tension. What is a friction massage and how does this help ? Is there a common cause related to tennis elbow ? How can it be prevented ? Common causes of tennis elbow are repetitive movement in one direction at the elbow, either repetitive bending or repetitive straightening or repetitive twisting of the elbow. This can cause a joint restriction and present with tennis elbow symptoms. The other common cause is repetitive gripping, more often and of greater strength output than one is use to doing ie. gripping a pencil to write and gripping a gardening tool to dig are both very different. The latter of the two can cause a 'tennis elbow' presentation where the tendons of the forearm extensors have been strained to much too soon and now they are inflamed. In the case study above, 6 months of pain is too long for his problem to only be due to inflammation. The inflammatory process only lasts 7 to 10 days. A mechanical assessment of the elbow would be the first step to determine if he has a joint restriction and how to treat it. 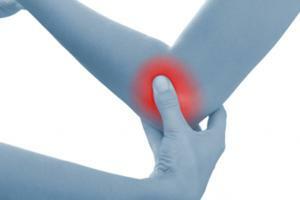 Patients with tennis elbow, or lateral epicondylitis, all have pain; it’s a painful condition. Some patients may experience some associative weakness, but by and large it’s associated with pain. Once you have injury to a joint you often have to modify how you exercise going forward. @Kimberley, that is a very good point. He needs to mention to his physiotherapist that his tennis elbow just started a new exercise program. His physiotherapist will have insights into what to avoid in initiating new exercise programs to avoid tennis elbow/pain or injury. I am curious to know what kinds of foods are considered anti-inflammatory as so many conditions are caused by inflammation, such guidelines can help many people, not just for tennis elbow. 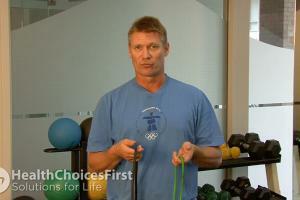 This website, Health Choices First, has a good video on the types of anti-inflammatory foods to have.